Guys, this post is in the form of an audio file about Khuru; the transcript can be found below. gListen to the file and learn about Bhutan. Pictures accompanying this post are here. A warm welcome to y’all out there. This is Sam – aka Sam Dorji - from Samtse, Bhutan. During the next couple of weeks, I’d like to present you a couple of audio samples from Bhutan. Living in a different culture, you are not only discovering new food, new customs, and new environments, but as well very special sounds. After having returned back home to Switzerland last August, I discovered how hard it was to tell my friends back home about the environment that I was encountering in Bhutan. Part of the reason for why it was hard to explain them was that I couldn’t give them access to any sound samples. There are certain things that you have to listen to in order to get a good feeling for a place. The first audio sample gives you an impression of a traditional Bhutanese game. The name of the game is Khuru and it is played by men all over Bhutan. A Khuru is a dart that is made out of wood and a nail. Every Khuru player builds his own two Khurus. As you can build your own Khurus without a lot of effort, both rich and poor folks can play Khuru. This is not true for archery which is as well very popular in Bhutan. Bows that are used for archery might cost a fortune. But let us go back to Khuru. Did you like the song? Can you imagine how they dance? You probably start to understand why it is hard to get a good feeling for Bhutan without having listened to such songs. Let us continue where we left. The team that gets most hits during a round wins a point. Sorry, I cannot quite recall how many points you get, but I think it depends on the number of times that you have hit the target and how many times the opposing teams have hit the target. If none of teams hits the target itself, the Khurus close to the target are counted. The team that acquires first 25 points has won the game. It might be that the number of points that you have to get in order to win a game might be different from tournament to tournament; I’m not quite sure. The Khuru tournament that I have observed today started in the morning at 8:45am and most of the games were still going on at 3pm. Being in the sun all day long – considering that it is about 30 degrees Celsius in Samtse – and throwing the Khurus to a target 20 meters away makes Khuru quite a tiring sport. Folks out here love playing Khuru but often they have a sour arm the day after. Guys, hope that I could give you an impression about life in Bhutan. Cu next time and enjoy life. All the best from Samtse, Bhutan. This is Sam Dorji. Together with Karma, we went up to the roof and reconnected all cables and cleared any dust that might have settled. Speed was still not better and Karma started to call various places around the globe - but speed didn't really improve. 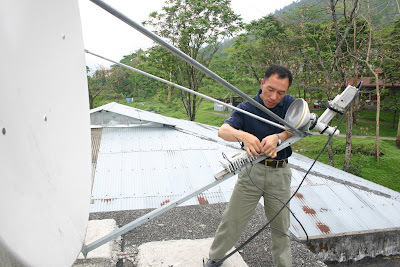 The Samtse College of Education will upgrade to 2Mbps soon and Karma promised to investigate further at the time we increase the bandwidth. Karma reconnecting the satellite receiver. Uncle, uncle, what is your name? How old are you? What is your father's name? My name is Karma. I'm in fourth grade. My father's name is Sonam. This is my friend, he is in second grade. His name is Tashi. Where are you from? He is taller than me. Are you married? What is your daughter's name? Kids often approach me, want to sit next to me, and ask me tons of questions. Even though they are really young, it is amazing how well they are speaking English. English might be their second or even third language (after Dzongkha, Sharchop, Nepali) but still they are able to grasp the language at a very early age. Sure, they are not yet fluent but they will be getting there pretty soon. Medium of instruction in all schools is English and the use of Dzongkha is limited to a short period every day. Even in kindergarten, kids are trying to use English sentences. Sure, it is not that way all over Bhutan. Samtse is a forward-looking place in Bhutan. Folks in this area are pretty well educated and as a consequence, they help their kids from an early age on to get excited about school. Additionally, most of the kids that I interact with are the kids of lecturers. If you go out to remote places, the situation might look different. Some teachers might have problems with the English language and kids might not be well-supported by their parents in learning a new language. As a consequence, it might take a bit more time for them to get the feeling for the language. But still, they will grasp the basics and be able to communicate reasonably well in English. That's at least my experience from having interacted with the students at the Samtse College of Education. “Why have politicians?” people wanted to know, expressing doubts about the results of democracy in neighboring countries. Isn’t the king always supposed to know what is best for his people and guide them accordingly? It sounds like a bad joke - the King is offering the people the installation of a democracy and the vast majority of the people strongly oppose. Not quite sure whether there is a country that was in a similar situation. Having the democracy in Nepal in mind, many people in Bhutan are scared to make this step. It could turn out the same way in Bhutan. Talking to people, I always try to encourage them and tell them that following a democratic process is probably a good thing. I try to argue that they have been extremely furtunate with their kings and that somewhen in the distance future, there might be a different King. If such a King should really come to power, the Bhutanese people might be glad to have a democracy in place. All in all, I like the article in the NY Times though there is one aspect that is left out. The writer of the article has obviously gone to Thimphu to observe the elections. Parts of his story seem to indicate that this whole mock election thing is a bit of a joke. 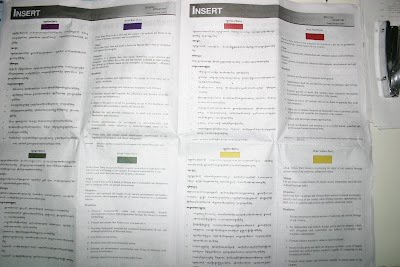 Why should you have mock elections and select among parties that are indicated by colors? The author had better gone out into the country and observed the elections out there; I think it is a whole different story out there. Picture taken from an ad in the newspaper Bhutan Observer. Most of the lecturers from the Samtse College of Education - and many of the teachers throughout the country - have been out during the last 10 days in order to help out with the mock elections. As there is a huge number of remote villages in Bhutan, some of the lecturers had to walk for four days to reach the village where they had to conduct the mock election. No car but monkey trails instead. Leeches all over, crossing rivers without bridges. Conducting the elections in villages with villagers that still need a fair bit of education. 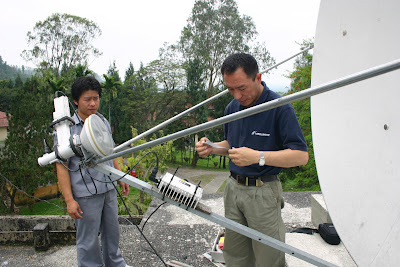 After the election, running up the next mountain to catch a signal to transmit the result to the regional center. And after the election process, running again down the mountains to start teaching again as soon as possible. More than one lecturer at the Samtse College of Education has a sour leg. If you look at the mock elections from this perspective, performing them is a very important step on the road to democracy. The students at the Samtse College of Education are divided into eight collaborative groups and each group has to put a cultural show into place. The program consists of various dances and performances. Most of the students are absolutely amazing dancers - this isn't actually a surprise as the kids learn to dance early in their school lives. The students perform traditional Bhutanese, Hindi, Tibetan, Nepali, and English dances. Well this Wednesday, some of the students will as well perform a traditional Swiss dance. I'm not quite sure whether it is really a traditional Swiss dance though I hope that it is at least similar. So let me explain why this group is performing a Swiss dance. The students decided to have a special item that included dances from all over the world. They talked to me and asked me about music from different places; I was able to give them access to music from the US and to traditional Swiss music. After we recorded the two songs that they selected onto an audio cassette, they wanted to get advice on how to dance a traditional Swiss dance. Well, that's a legitimate request though all of you Swiss guys out there will know that I have never ever been dancing a traditional Swiss dance. So how do you teach somebody how to dance in traditional Swiss style even though you cannot really do it yourself? You try to recollect all your odd memories from those days when you have been watching 'Samstigjass' with your grandfather. In that TV show, there was now and then a traditional item - so let's get those few steps that you can vaguely remember. Put those memories into a Bhutanese classroom with a bunch of really gifted students. Hop around stupidly and hope that your Bhutanese friends will understand what you mean to be doing. That's about what I did and to be honest, the result is not too bad - I'm almost a little bit proud. I'm looking forward to tomorrow night and observe the students perform the traditional Swiss dance :-). On a side note: During the last couple of days, I closely interacted with the group that is performing this Wednesday. It is amazing to see that the organization of such a show works pretty similar to the organization back home where we have a 'Turnshow' every two years. In both settings, there are a few folks that run around and are responsible for about everything. In our case back home in Taegerig, those persons have been Toebe, Adrian, and Tiisli. Here, it's mostly Tashi Wangchuk that has been doing a great job. Even though our two cultures are very different, the organization of those shows seem to work very similarly. Samtse has a subtropical climate. It can get rather hot but cools down as soon as the rain season starts. During my last visit to Samtse, the rain season didn't start until the end of May. We have now end of April and the rain season seems to have already started. Staying in Samtse during rain season means to have sometimes fog in the morning, short and rather strong rain periods throughout the day and sometimes really heavy storms with immensely wild thunders at night. You probably think that you know what heavy rain is. Let me tell you, you don't know. If it is really raining down here, even a huge umbrella won't protect you from the water - the rain will at least going to wet your shoes. During the night, the rain will drum on my tin roof and wake me up - unless I haven't already woken up by the thunders. Well, my apartment this year has at least a tin roof and ensures that the walls won't get easily moldy; I actually enjoy being woken up considering that I could as well have no tin over my head. Due to the heavy storms, now and then a tree gets killed and we are confronted with major power cuts. Last week, more than one power cut occurred and power supply was rather unstable. A few hours of power supply, a few hours without. Not exactly fun if your laptop battery is more than three years old and runs rather unstable in this humid climate. Last Thursday night, there was a problem in Phuentsholing and we didn't have any power at all for the entire Friday and power came back only on Friday night. You might be able to imagine that running ICT infrastructure in this climate is not exactly easy. We do our best and try to cope with the external circumstances. Additionally, our satellite-based internet connection has been cut for the last couple of days and has come back only this morning. It is not entirely clear what caused the outage but it might have been the rough conditions. We'll have to investigate and solve the problem. A few weeks before coming to Bhutan, I discovered a podcast helping people to learn how to speak Dzongkha, the national language of Bhutan. I listened to the podcasts and liked them a lot; you might remember that my knowledge of Dzongkha is rather limited. I thought that the idea of having a podcast that enables you to learn a new language is a pretty neat one. I got in touch with the person that is creating the podcast and it turned out that he is staying in Thimphu. 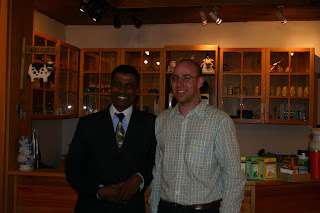 As I had two days in Thimphu at the beginning of my time in Bhutan, I arranged a meeting with him. We met one evening, went to a coffee shop, and had a chat. V. Shankar - the creator of the podcast - turned out to be an enthusiastic person that tries to help people to learn Dzongkha. He creates the podcast in his free time and sees this as a community service. He is as well a magician (he showed one of his tricks during our conversation - quite amazing) and told me that all he needs when he performs is the smiles of the kids. It's the same with the podcast - it's about getting the appreciation of the community. During the last couple of days, we had a couple of heavy storms. Trees were hit by lightnings and some of the power lines were damaged. Power seems to be back to normal now but we had additionally a problem with the internet connection and we got our connectivity back only a couple of hours ago. Jam session Saturday night was fun but unfortunately, we had to stop early as power was cut off at 11pm :-). 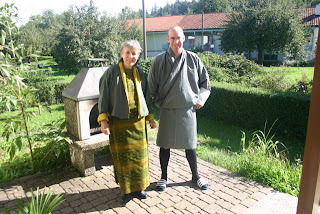 On the 5th of April, Robyn Smyth and I were traveling down to Samtse and arrived well. Yesterday and today, we tried to settle in and get used to different weather conditions. It feels good to be back to Samtse and to meet many well-known faces. It has been a warm welcome and I will be able to settle in fast. Tonight, there will be a jam session (a Bhutanese disco) and I'm very much looking forward to that. 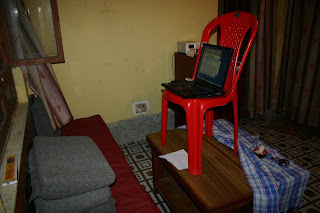 The picture below shows my living room and what it takes to get a wifi connection :-). Today, I got some shopping done. In the morning, I went to a grocery shop and bought 7 kg of pasta as I cannot get pasta down in Samtse . I'm really excited about that. Later on in the day, I went to the shop of an uncle of a friend of mine. Last year, I bought a Kira (the traditional dress for women in Bhutan) for my mother from this shop and I wanted to give the owners a picture of my mother and me wearing Kira andGho . It was a funny moment as it turned out that I mixed things up a bit and didn't put my mother's Kira on correctly. You can find the picture below; I mixed up the yellow and the green top - they should be the other way around. We were laughing a lot and it was a good moment. Tomorrow, Robyn Smyth (from the University of New England in Australia) and I will be traveling down to Samtse. Although it's only 200 km down to Samtse, the trip takes around 8 hours and we will be leaving early in the morning. I have happily survived the landing in Paro yesterday though my luggage arrived only today because of technical difficulties. Due to miscommunication on my side, my luggage is currently stuck in Paro and I'm in Thimphu. Due to road construction, it's about a three hours drive from Paro to Thimphu and therefore we are not able to pick up the luggage in Paro. Marianne Frei from www.phzh.ch will be coming to Thimphu tomorrow afternoon and I hope that my luggage will travel with her. Consequence? I'm stuck in Thimphu with only my hand luggage. Due to weight constraints (my big bag was above the weight limit), my hand luggage contains only technology, books, and pictures. No clothes at all. So all I have is the things that I'm wearing. Not really nice but if you are going to a place like Bhutan, that's one of the things that you have to cope with. I have to mention that folks here in Bhutan are really friendly. People at Helvetas help me to get my luggage and made many phone calls. And I got even a pyjama :-). Guys, I'll be traveling down to Samtse on the 5th of April and will come back to you as soon as I have arrived in Samtse. Bhutan is a charming country in the Himalayas. All houses are painted extensively, folks are peaceloving and put their priority not on money but rather on happyness. Women wear kiras and men put on ghos - a nice change from what we are used to in the west. Sure, those dresses are not extremely easy to put on but even I got used to it after a few weeks of practicing. The only airport of Bhutan is located in the Paro valley. As Bhutan is a country in the Himalayas, the Paro valley is a real valley with high mountains around it. Searching for Paro, Bhutan in Google Earth and activating the Terrain layer will give you a good idea about the landscape that a pilot is confronted with. If you want to get in impression of what it means to be landing at Paro, have a look at the video. Watching this video, you might understand why I'm very much looking forward to get my feet on Bhutanese ground. Before my last trip, I did know that the landing procedure in Bhutan is special though I was not prepared for such a landing. This year, I know pretty well how it will feel and that doesn't really help :-). I come back to you as soon as I have survived the landing in Paro.